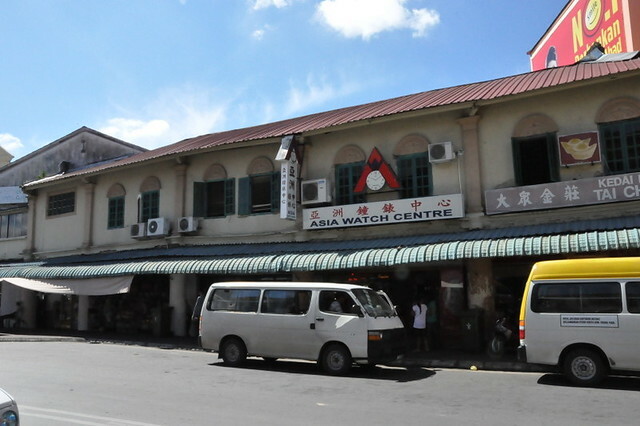 It's always been a hassle for us Sabahans to get a Chinese visa because the Chinese embassy maintains only two branches in the country, one in KL and one in Kuching. The runners make their trips on Tuesdays and Fridays and if your schedule doesn't fit, you need to fly to those cities yourself. And that was what Yi and I did yesterday. We flew into Kuching in the morning and left the same night. I've been to Kuching once, more than 10 years ago and I can't remember much of it. 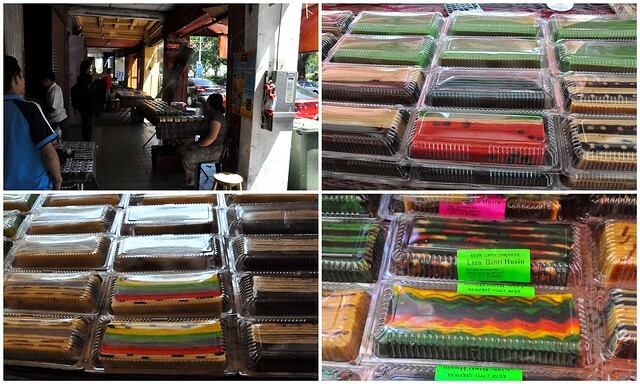 Kuching is said to have some of the best food in Malaysia, after Penang. Some would say Malacca too but I wasn't impressed on my previous trip there so Malacca's not on my food wish list. My first impression of Kuching's airport was that it was better than the budget Terminal Two in KK but Yi informed me that Kuching has only one airport. Strike One KK, because we have a Terminal One and it's an in-ter-na-tion-al airport. 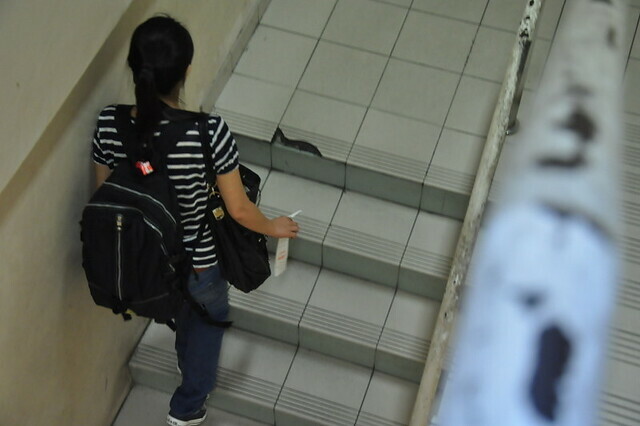 On the way into the airport, I was walking up the steps when I suddenly bumped my head against a ledge overhead. If the steps are crowded and you are taller than 5 feet, you will get a nasty bump if you walk up on the left of the stairs. While I was rubbing the bump on my head, another lady hit her head too and it wasn't funny because I could see she was in pain. After submitting the forms at the Chinese embassy, we found ourselves in the middle of no where, with no taxis. A vehicle that looked like a bus came along. We got on excitedly since it's been ages since we've been in a bus in Malaysia. In my excitement, I didn't take a photo of the bus, a relic kind of vehicle which was last seen in KK (Strike 2) in the 1970s. 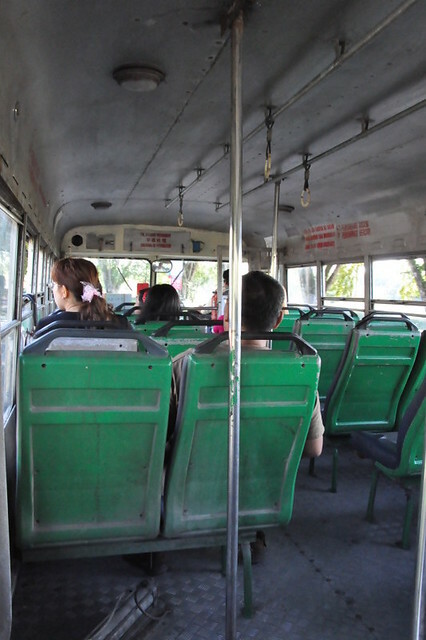 Here's a photo taken inside the bus. I think that's how it must be like in Cambodia. My impression of Kuching from the bus (fare was RM2/USD 70 cents per person; inflation has caught Kuching up) was that it is very big and widely spread out. There's no proper zoning and the city and residential areas are all merged so that there's no distinct city center. I'm not sure where the CBD is, or if there's any (not that we have much of a CBD in KK) and all the buildings were low rise, the tallest being about 10 storeys. 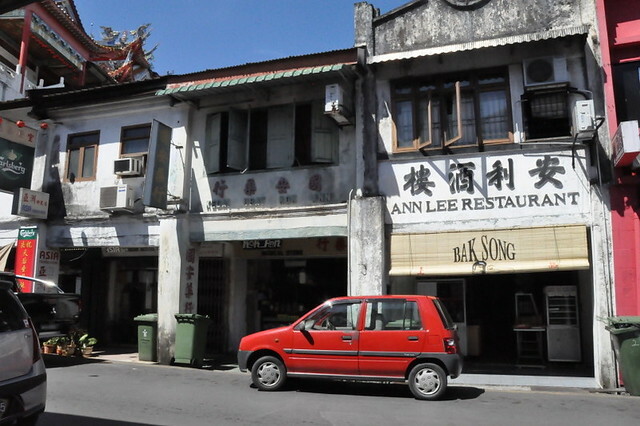 Old buildings such as the one in the photo above are still standing and they give a nostalgic air to the city (is Kuching a city?). Kuching reminds me of KK in the old days when I was growing up. I think what I like most about Kuching is the large expanse of greenery here and there although I think that whoever cut those dozens of big trees along the road from the airport should be jailed, if not executed. 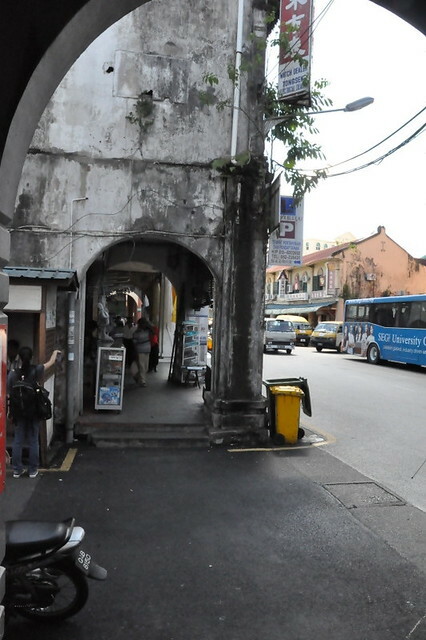 This looks like some parts of Penang. Shiou bee are like siew mai but not as tasty. I couldn't tell what meat was in them, but there were bits of crunchy stuff which I think were jicama (bangkuang). Yi thinks that shiou bee are the precursors of the Ausssie dim sims, those awful giant meatballs you find in fish and chips places. Kuching's got character. 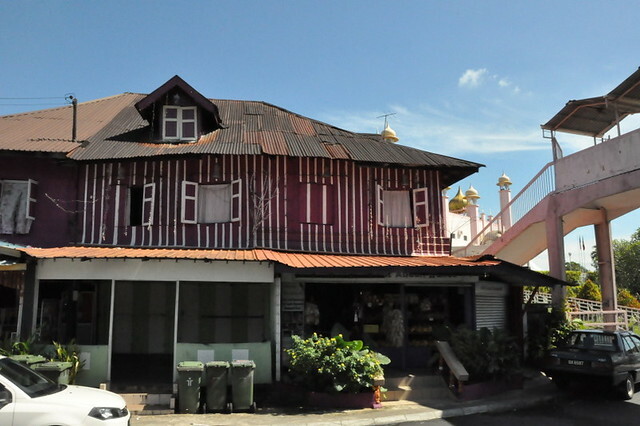 Unlike Malacca or Singapore where old shop lots with wooden shutters have been perfectly copied or touched up, the ones on Kuching are authentically old and the 1st storeys of the shop lots are still occupied by the shop owners. They even have columns with carvings, so European. KK has demolished all the old buildings and the city, like most modern cities in Asia, is characterless and uninteresting. Yi loves kuey chap (RM4/USD1.30), a noodle dish we don't get in KK. 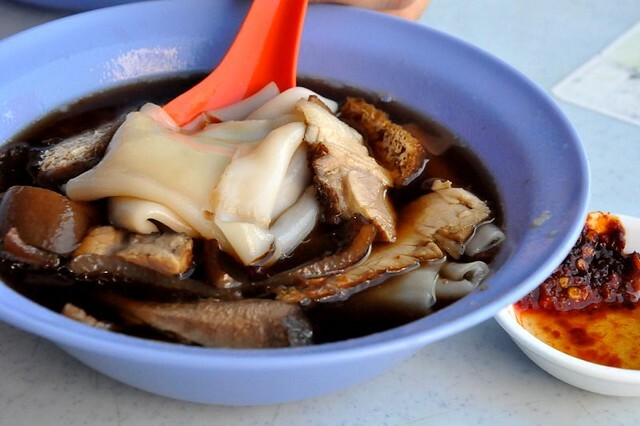 Kuey chap noodles are small broad pieces of rice noodles in a slightly herbal soup with pieces of pig offal. I was told by a shop keeper later that the best kuey chap is in Johor Bahru and it's called kuey chap gia (kuey chap kid) because the noodles are thin, not broad. Straight from the kuey chap stall on Jalan Ang Cheng Ho, we went to Min Joo, THE place for Kuching kolo mee. 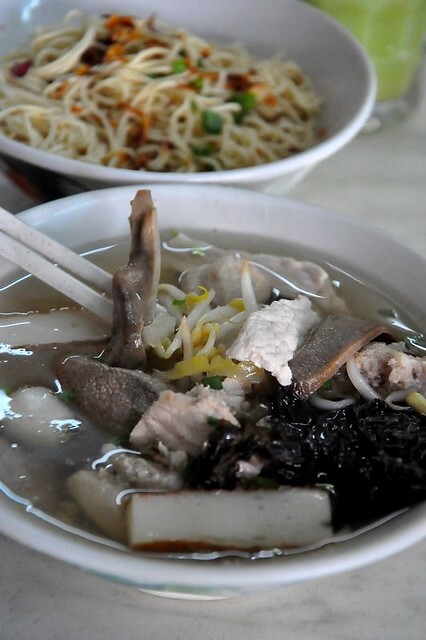 Kuching kolo mee (white dry-tossed noodles) is the city's second most famous dish, after Kuching laksa. Min Joo was crowded and we have heard that it takes an hour to be served. 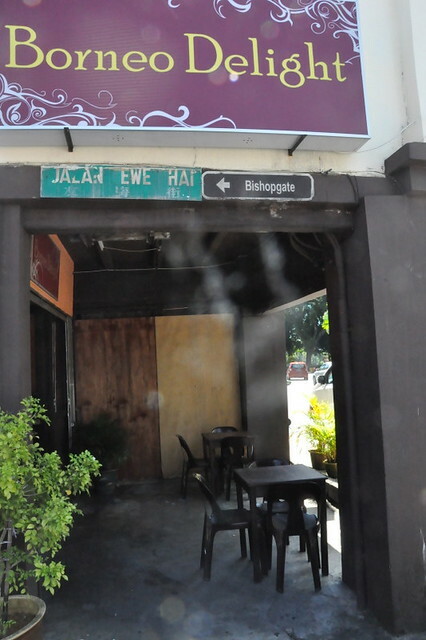 We couldn't spare an hour because we wanted to get to Choon Hui Cafe, about 15 minutes by taxi, for Kuching's best Kuching laksa. RM6/USD2.90 per bowl. You can choose to have the toppings on the noodles or in soup. Leaving Min Joo, we went a few steps away to Kim Joo, the copycat. There were lots of seats and we were served immediately. I found the kolo mee in Kim Joo just okay, a 7/10, not something I'll crave for mainly because I can get the same thing, more or less, in KK. 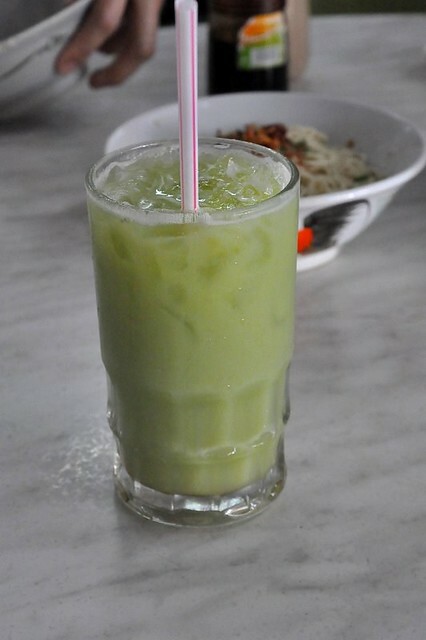 But this I like, the iced kedongdong juice RM2.50/USD85 cents. KedongdongYi sweated so much she needed to change her top. How rustic is that. We don't get such places in KK anymore. 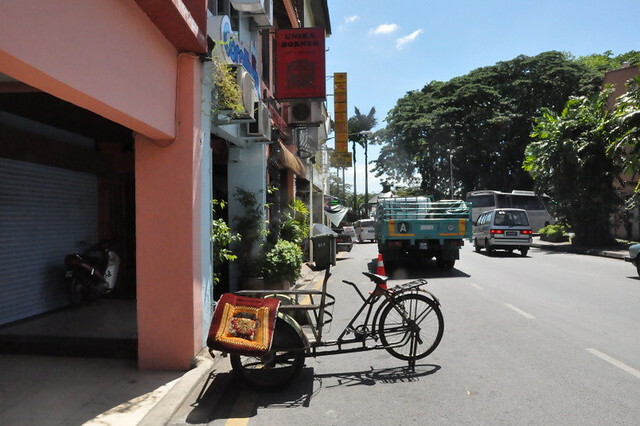 A strategically-placed trishaw in a street for tourists. 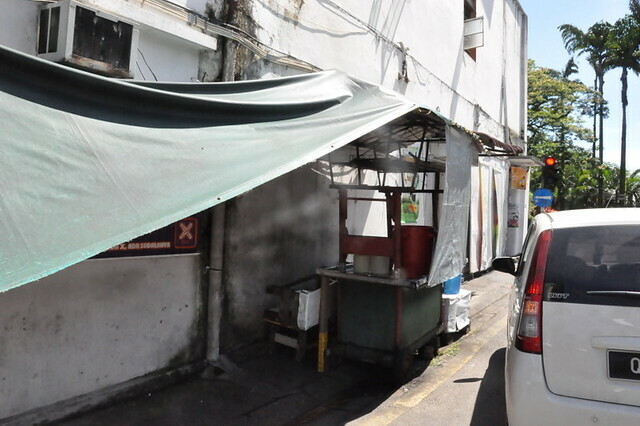 This stall by the side of a road serves the best iced cendol in Kuching. I was relieved it wasn't open. We turned the corner from Bishopgate and found an interesting street where people were selling colorful (but yukky) lapis (layered) cake. There were many souvenir shops too but they banned photo-taking even from the outside so too bad for them because I won't be giving them free ad space here. There were also some shops that sell local hardwood furniture and solid one-piece hardwood table tops which were absolutely gorgeous. 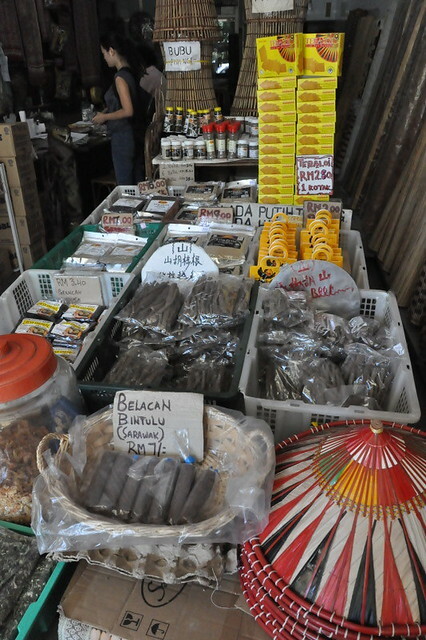 Sarawak is the leading pepper grower in the world and besides the peppercorns, this shop sells pepper roots (for soup) and pepper candies. No pepper spray. The shop keeper was an elegant lady, beautiful and standing straighter than a soldier at 82. 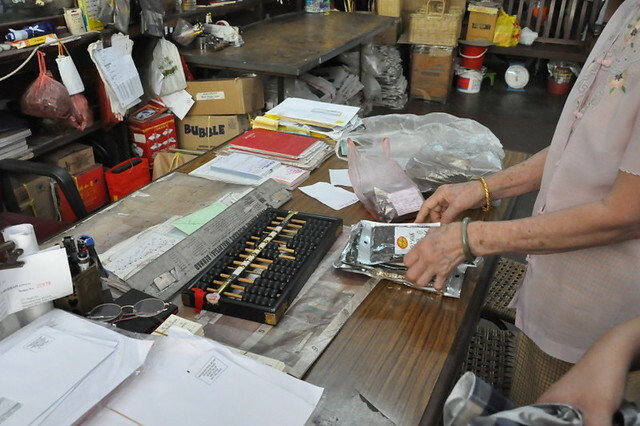 She used a Chinese abacus to total up our purchase and told me to use her calculator and yes, she was faster than me. I was 16 the last time I went to Kuching. From your pics it still looks the same. (is that good or bad?) . I loved Kuching when I went there because thre were large old trees and very shady. ps:I am glad the cendol stall was closed too. It looks grimy. It was fun hanging around with you yesterday. I thought I should pay your blog a visit since I heard so much about it from my sis. I like how you pick up details about Kuching that a native like me didn't even notice! Keep up the good work. wei, in case u grave for Kueh Chap, available at CKS penampang kobusak. Shop lot that facing main road, last corner shop. They sell kon low mee, kueh chap, and kuching laksa! I love their Kuching laksa! very very heong & flavorful. Kueh Chap was good! Nice!!! Now, I am tempted to go to Kuching too. How la!? With your pictures and stories of Kuching and KK, I am so tempted to hop on a plane and just go. It was interesting to read about my hometown from your perspective. Each time I go back, it's always a bit of a rush trying to see all my friends and relatives so I hardly get to hit all the touristy spots. Glad you called us up. We could have brought you to more places & feed you more if we knew you were coming earlier. Loved the bus shot. It really looked like it was plucked out from a Third World country like Cambodia or South America. Hmm... In that sense I think the BN really failed us here. Anyways, it was good to catch up with you since I missed the boat in KK the last time! I beg to differ on your comments in Kuching. I left Kuching almost five years and settle in Australia now. Kuching does have a CBD which is visible with high rise buildings over 20 stories. Kuching International Airport is definitely modern and better looking compared to the aging Melbourne, Sydney, Brisbane and Perth Airports. I fly almost weekly in Australia to different cities but I don't work for air liners. 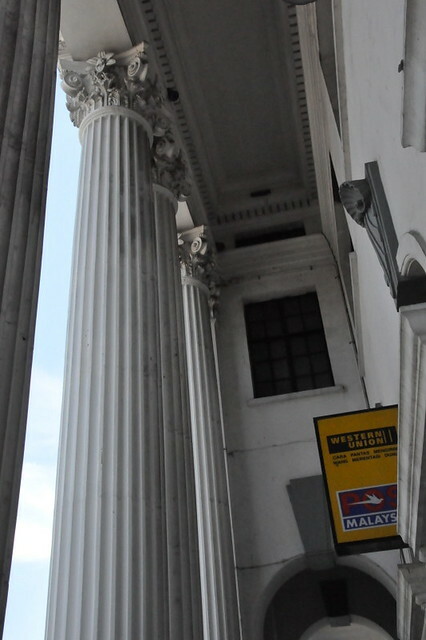 Kuching has two cities coucils and a rural coucils. The three coucils are wide spread and cover a population close to half a millions. I do agree that what Kuching lack is public transport. Most local people will have their own transportation. I do hope that the state government can run the commuter service rather than the private transportation companies that cannot justify the profitability of their operation. What I think is that you either try to belittle Kuching or do not have the opportunity to explore the city with your very limited time. zurin: good question. it's good for ppl who don't live there nbad for ppl who do. it's like how we say natives living in the jungle have such a charmed life but in reality none of us would want the same life so how can we assume the natives do too? denise: i went ther but couldn't find the shop. exactly where is it bc which main road r you talking about? name of shop pls? greg: so i have your pledge in black n white :0 thank you n nee so much for your wonderful hospitality! this is public but i'll say it anyway. you are a great guy n nee's so nice too and you both are so wonderfully matched! william: you are offended bc i said kuching's airport is disappointing or there's not much CBD? it both amuses and irritates me how ppl can be so sensitive! let the truth be known so tt there can be improvement! anyway, watch out for part 2 if you think i dissed kuching in part 1. gosh. Kuching.. Nice place for Vacation. I think your observations about Kuching are mostly spot on. I don't know where you got that Kuching was second to Penang in terms of food. In my opinion, KK has much better food than Kuching! 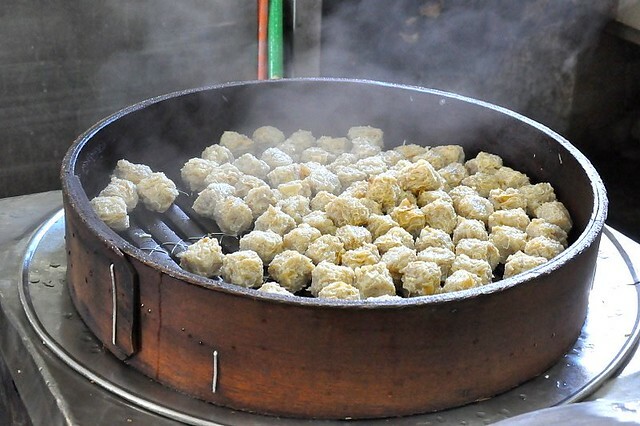 Explore further and you'd be amazed with the variety of food Kuching could offer. You need to stay at least a week to enjoy all that. I could blog the same about KK if I were there for a couple of days. anon: i'm sure any place would be better if we knew where to go so you are prolly right. This is a late comment. If you are here now,we are much better off than when you were here before. Our buses are air-conditioned and lots of taxis around. Whether in Kuching or KK,these places will always have their good food.